"Ive never been to Omaha, but I played in Lincoln before in another band. I kinda remember it because we drove by it, it has really tall buildings, right? Maybe its because its so flat out there, that they stand out..."
Thalia Zedek, guitarist/vocalist/song writer for indie-rock legends Come says this with a thick, East Coast drawl. She stops and starts as she speaks over the phone, watching as equipment is loaded into the nights venue in London, Ontario, the third date on their 6-week tour that will bring the band to Omahas Cog Factory Saturday, Feb. 28. She sounds anything but how the countrys rock media have described her music: gloomy, dark, black, brooding, depressing. Fans of Come will tell you that beneath the musics minor chords, guitar pounding and disturbing lyrics, there is an uncompromising beauty and honesty that leave listeners both numb and wanting more. Zedek says she gets tired of being described as a Gloomy Gus. "Especially because Im really not like that as a person. When I do face-to-face interviews, people are actually surprised that we (the band) joke around, that we dont take ourselves that seriously," Zedek says, then trails off onto another thought. "But on the other hand, I know that some of its kinda deserving. Some of the songs are dark, or whatever... I prefer to think of it as more passionate music instead of depressing." Tags have been placed on Come since the bands breakneck, breakthrough first album, Eleven:Eleven, in 1992. Remember, this was the height of indie musics golden moment, with Nirvana, Dinosaur Jr. and Bob Mould all breaking into above-ground radio play. Come didnt share in the glory, because their music was way too hard, too uncompromising for program directors looking for something cool, but not necessarily honest. Comes music is huge, anthemic, with two lead guitarists trying to outdo each other as they spill out their emotional guts. The other half of Comes one-two punch comes from Chris Brokaw, former drummer for Codeine, who co-writes with Zedek, and since 1996s Near Life Experience, has contributed some lead vocals. His dry, unemotive voice is the perfect compliment for Zedeks guttural howl, which could be compared to Courtney Loves if Love had an inkling of Zedeks control or talent. 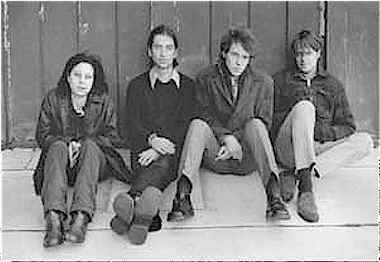 Zedek says she and Brokaw have grown past their influences, but when they started out, "we were into the Rolling Stones, Gun Club, early British bands like the Only Ones, the Go Betweens, the Bad Seeds, These Immortal Souls." They certainly havent grown far from their musical roots. However, Gently Down the Stream, Comes new CD on Matador, is a departure of sorts. Sandwiched between dense slabs of guitar are a few somber, even quiet moments. "Saints Around My Neck," for example, begins with a lilting, chime-like two-guitar melody. But before you know it, along comes the trademark pounding assault, as Zedeks voice goes from a quiet confession to an angry, blazing testimony. The gentle/brutal combo makes for a disturbing metaphor for a song about, well, religion? Zedek, doesnt give many clues. "Pretty much I wrote most of that song, that beginning riff with the two guitars," she says. "The part after that I kinda been kickin around for a while, it took a while to gestate. A lot of our songs are like that, actually. Its weird. Some parts in that song were stuff wed been messing with for a really long time." Yeah, but whats the song about? The lyrics, as I can make them out at the end of the track: "What have I done?/Something is wrong/Should I have known?/Fedra is gone/Everyones sick/Saints around their necks/Defending themselves/Taking their pills/Im falling down/I lost my crown/I cant confess/With saints around my neck/I cant even breathe/Something is choking me/Is this a warning/Why dont you show me?" "Its kinda like about, well, about superstition," Zedek says. "People wearing saints around their necks; religion for the superstitious side." Zedek is even less helpful with the another standout, "Middle of Nowhere," which starts out sounding like a lullaby, until the second verse, where Zedek describes a horrid car accident from the drivers perspective. Was that one autobiographical? "Thats actually kinda from a dream I had," Zedek says, "and it was kinda about a relationship. It actually is autobiographical. I did have that dream, that I was driving in a place like west Texas, really barren, and there was a car wreck. I was in a truck and they had to extract me through the windshield, but it wasnt really that scary of a dream, it was one of those cinematic dreams, where youre, like, watching a movie." Zedek says its "kinda cool" to know that they might be playing to an audience most of whom will be hearing her band for the first time. Certainly the Cog Factory will be a stark contrast to Minneapolis 400 Club, where theyll play the night before. "Were used to it," she says. "Thats how tours are, you play one city then a different one and its a different situation. Its always nice to have a lot of people, but the size of the crowd doesnt affect the kinda show we do. You can play for a bunch of people and think I totally blew it, you know what I mean? Ive had a really fun time playing for not many people, it depends on the people whore there, the atmosphere. We always give it our all." Printed in The Reader February 26, 1998. Copyright � 1998 Tim McMahan. All rights reserved.